Is it sometimes inconvenient and/or annoying to await the arrival of a package at home, or have it sent to your place of work? Yes. Do you want a drone finding your location via smartphone and dropping a package wherever you happen to be? Perhaps, though we can see some settings where Amazone’s idea for its delivery drones might get a bit awkward. 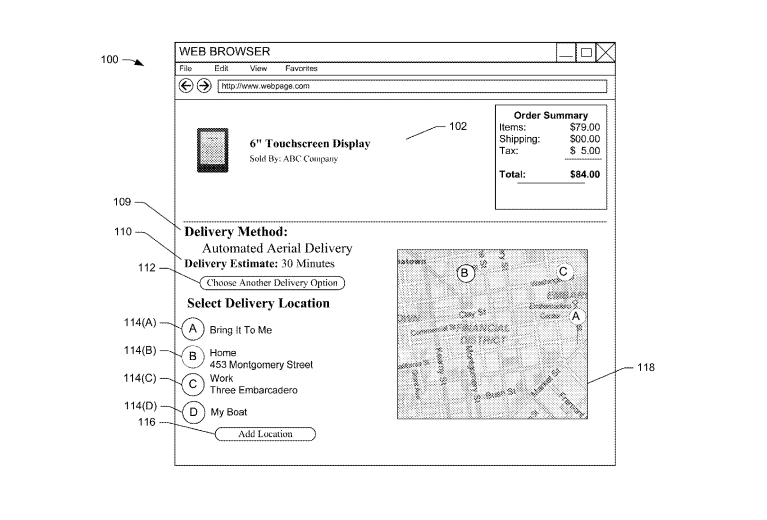 Amazon details its idea in a patent for an “Unmanned Aerial Vehicle Delivery System” (via BBC), including the ability for drones to track the location of the person it’s bringing a package to using data pulled from their smartphones. And like a bunch of commuter birds in flight, the drones will also be able to chat with each other about the weather and traffic conditions, allowing them to update their routes in real time. The drones would also constantly be monitoring for humans or other animals that might cross its path, and adjust accordingly. This does bring into play the question of the “porch” temptation — what’s to keep interlopers from nabbing the packages before they reach their intended recipient? Ostensibly, that’s also something Amazon would be working out. The patent also outlines a plan where Amazon uses different kinds of unmanned vehicles depending on the package’s shape and weight. I now see a future of “drone-watching” — complete with books describing the various species of unmanned aerial vehicles. Of course, just having a patent doesn’t mean that the final result will be identical to the description. There are plenty of legal regulations still being worked out to govern what drones can do and where they can go. And it’s only been a month since the Federal Aviation Administration gave Amazon and other companies approval to test drones, so the future of drone deliveries could still be a few years away.